With a thriving art scene, a charming historic centre, an outdoorsy influence, and (of course) Oktoberfest, the Bavarian capital of Munich is an underappreciated escape that blends culture and nature, making it perfect for a city break. Between the beers and sausage there are beautiful museums, a budding culinary scene and even a surfer's paradise waiting to be discovered. Here is how to spend an unforgettable 72 hours in Munich, and if you're looking for even more inspiration, check out things to do in Munich. Explore Munich's lovely historic quarter by beginning the morning at the market. 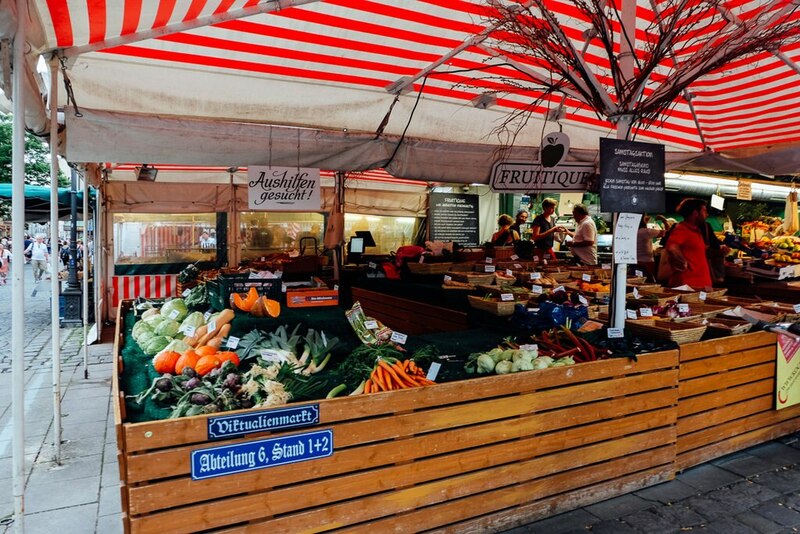 The viktualienmarkt is home to over 140 stalls selling fresh foods to stock any kitchen, as well as prepared meals for visitors on the go. Start with coffee and pastries while you wander between butchers, specialty chocolatiers, flower sellers, and fish mongers. Located in Martzplatz, viktualienmarkt is a few minutes' walk from Marienpltaz - the city's main square. Be here at 11 am, when the Rathaus-Glockenspiel (the town hall's clock tower), chimes and life-size figures rotate to bells, putting on a 15 minute show. 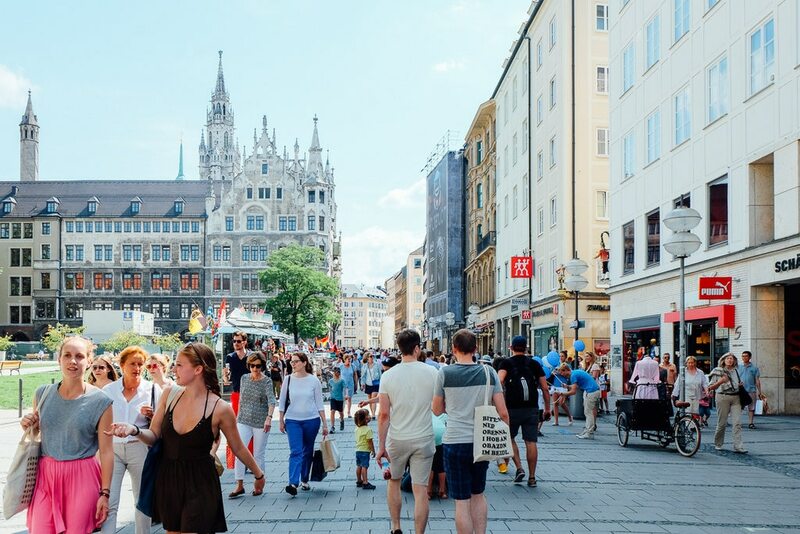 From there, follow the small street of Sendlinger Straße to explore Munich's family-run shops, or opt for the pedestrianized area of Kaufinger Straße to be lost in a retail whirlwind. After a day of wandering through historic areas, indulge in classic Bavarian comfort food by booking a table at trendy Spezlwirtschaft. Then fully re-enter the present by cosying up to the bar at Zephyr for contemporary cocktails. Munich's city centre is lovely and easy to navigate thanks to its size. After seeing the sights, head for the green park of the urban periphery. Grab breakfast and a delicious specialty coffee made at Man vs Machine, before catching the bus to Englischer Garten. With 3.7 km2 of green space, the English Garden is larger than Central Park. Rent bikes or bring your runners to explore the extensive trails, or pack a picnic to enjoy on the lawns. 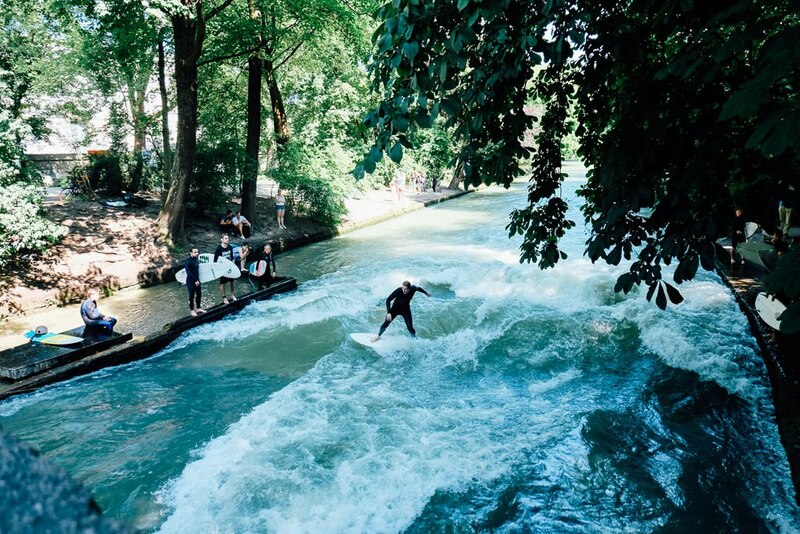 Don't miss the urban adventurists who line up along the banks of the Eisbach River to surf a small wave made by water rushing under a bridge. If you haven't packed a surfboard, you can still enjoy the river by floating downstream on swim rings on sunny days. After taking in landlocked Munich's thriving surf scene, settle into a riverside seat at Seehaus. Inside, the classic restaurant offers upscale meals. 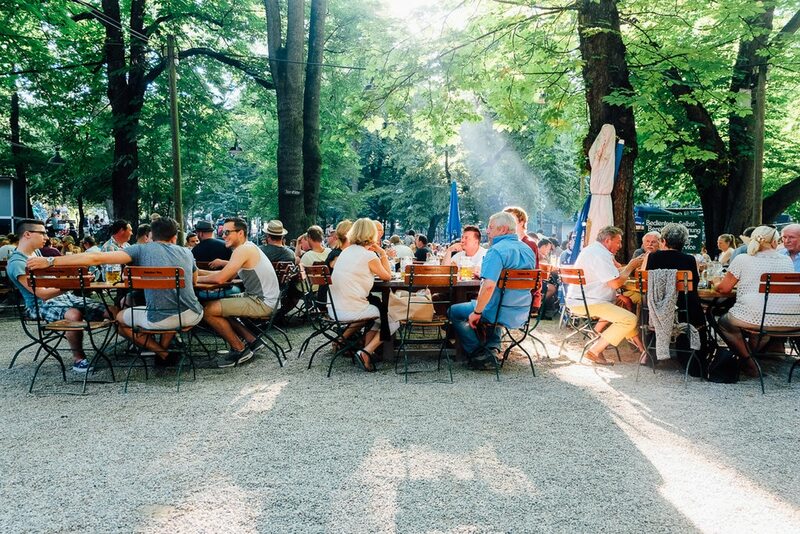 Outside, a relaxed beer garden is the perfect place to while away hours with pints and pretzels. After a day of biking or urban rafting, nurture your more artistic side with a morning of Munich's best museums. A single ticket will grant you access to Alte Pinakothek (one of the oldest galleries in the world), Neue Pinakothek (a wide collection of French impressionists), Pinakothek der Moderne (packed with Picassos and Warhol) and Museum Brandhorst (contemporary pieces from internationally renowned artists). Located within an easy walk of each other, you can take in the great works without having to travel to distant ends of the city. 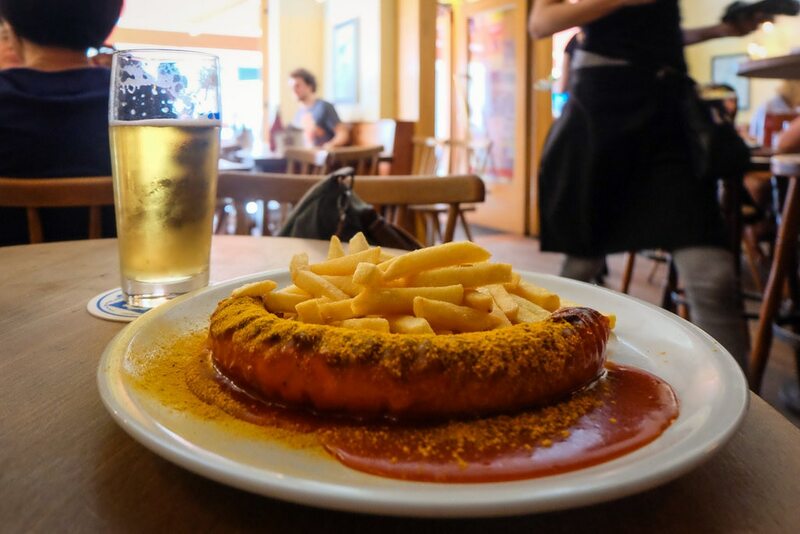 With time to spare, break for lunch at lively Steinheil 16 (Steinheilstrasse 16), where neighbours meet to catch over the best schnitzel and currywurst in Munich. Back in the center, add one more museum to the itinerary and explore the Munich Residence for a taste of life as Bavarian royalty. The gorgeously ornate rooms and extensive gardens are the ideal way to cap off three days in the city. With time for a final beer, Bratwurstherzl is a traditional 17th century tavern that is serious about pints. Order yours with a side of classic Bavarian sausage and cheer to the perfect holiday in Munich! Prost! Munich isn't the only city that can be explored in three days; check out Expedia's 72 Travel Guides for more tips and inspiration for cities around Europe. Tucked between the Alter Botanic Gardens and München Hauptbahnhof, the city's central train station, NH Muenchen Deutscher Kaiser is an ideal base for exploring Munich. It's also 1 km south of Konigsplatz, a large public square that is home to the State Collection of Antiquities. Designed by Chicago architect Helmut Jahn, this “transparent” glass-and-steel hotel is inside the Munich Airport building, between Terminals 1 and 2; downtown Munich is 37 km (23 miles) away. Located in Ludwigsvorstadt, this hotel is within 1 mi (2 km) of St. Paul's Church, Marienplatz, and Asamkirche. Church of Our Lady and New Town Hall - Glockenspiel are also within 1 mi (2 km). Located in Schwabing, this luxury hotel is within 3 mi (5 km) of Chinesischer Turm, English Garden, and Marienplatz. BMW World and New Pinakothek are also within 3 mi (5 km). Thanks to its unique location on the airport premises, hotel Novotel München Airport is the perfect stopover for business travelers from all over the world. From May 2010, the hotel will be able to offer you the best facilities for successful meetings with stat e-of-the-art technology and an innovative conference concept - Meeting@Novotel. The hotel has 257 rooms decorated in warm colors and equipped with ergonomic furniture to provide perfect relaxation at the end of an eventful day. Details available at check-in. Subject to availability. Other restrictions may apply. Located in Maxvorstadt, this hotel is within 1 mi (2 km) of Spaten Brewery, Marienplatz, and Church of Our Lady. Old Pinakothek and Pinakothek der Moderne are also within 1 mi (2 km). Situated right by the Hauptbahnhof train station, Fleming's Hotel München-City is in the center of the Munich and within walking distance of the city's main sights, including the old botanic gardens. Historic Karlsplatz Stachus can be reached on foot, as can the Viktualienmarkt, a foodies' paradise. Located in Maxvorstadt, this hotel is within 1 mi (2 km) of Augustiner Keller, Marienplatz, and Church of Our Lady. New Town Hall - Glockenspiel and Asamkirche are also within 1 mi (2 km). Situated in the Schwaig business park, just four kilometers from Munich airport with transport links to the city center. With simple modern furniture and fabrics in soft, earthy colors, the 236 air conditioned guestrooms all have minibars. Guests can work up a sweat in the gym, enjoy a nightcap in the bar, or hire a bike to tour the surrounding countryside. Early 20th century hotel retaining some original features, located next to the main railway station in central Munich, close to Kaufinger Strasse Shopping area, Karlsplatz-Stachus square and the official Oktoberfest grounds at Theresienwiese. The modern 4-star Novotel München City is located in the heart of the Bavarian state capital, just minutes from the Deutsches Museum, the Gasteig cultural center and Marienplatz. 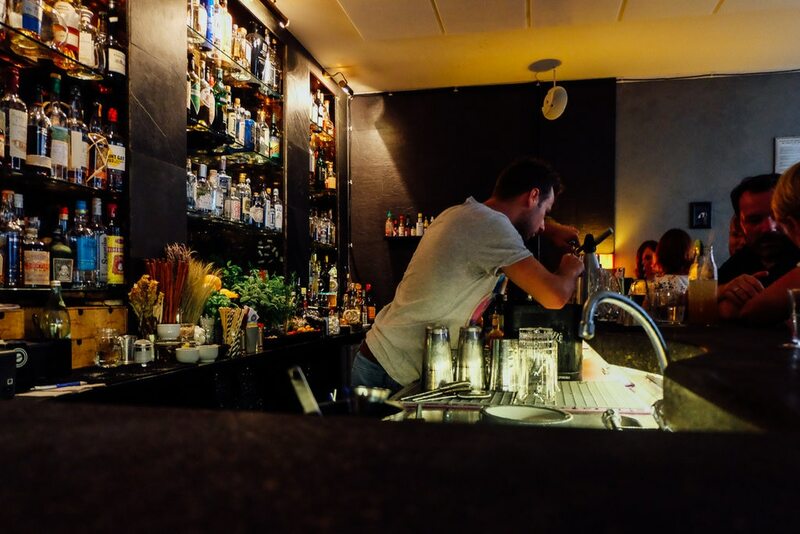 The hotel is close to Rosenheimer Platz station so can be easily reached bypublic transport and is therefore an ideal destination for those travelling by rail or air. When it is time to relax, why not visit the free spa area with its pool, sauna, steam bath and fitness center. Located in Schwaig, this hotel is 5.7 mi (9.2 km) from Erding Thermal Spa and within 12 mi (20 km) of Freising Cathedral and Weihenstephan Brewery. Schleissheim Palace and Allianz Arena are also within 25 mi (40 km). Located in Maxvorstadt, this hotel is within 1 mi (2 km) of Augustiner Keller, Church of Our Lady, and New Town Hall - Glockenspiel. Asamkirche is 1 mi (1.6 km) away. InterCityHotel München is next to Hauptbahnhof U-Bahn and train station. A 15-minute walk or 7-minute U-Bahn ride east brings guests to bustling Marienplatz square with its chiming Glockenspiel. The English Garden park and Oktoberfest grounds are also a short stroll away. This is a tour of two halves. Begin with an overview of the city, with its famous squares and galleries, before taking a trip to the striking Allianz Arena. Retrace the long history of Nuremberg, the birthplace of the Holy Roman Empire and a seat of power for the Third Reich, on a tour of the historic old town.